Take on the road with style and swiftness on the Mongoose Ledge Mountain Bike. The linkage system and full-suspension frame offer a cosy and precise ride while offering a stable base. The suspension fork smoothens out bumps with ease and the gearing has increased control. It has 21 speeds to choose from making you easily surmount every hill and slope. It also has a Shimano rear derailleur for accurate shifting of the gears. The crank offers a broad gear range while the linear pull brakes offer superb braking power and control. The wheels come in 26 inch and are fabricated with alloy rims for durability and lightweight. A 4-bar linkage suspension aluminium frame offering toughness and reliability. An efficient suspension fork that smoothens bumps with increased control. 21 speed gearing system to surmount challenges of different road conditions. A Shimano rear derailleur gearing system for accurate and efficient shifting. Reliable twist shifters that changes gears with ease. A 3-piece crank offering wide range of gearing application. Robust and high quality lightweight alloy rims. With some minor adjustments on the gears, it offers a comfortable ride and handles pretty well of a beginner bicycle. With this bike, you will get real value for your money as the performance is second to none and also because of the bicycle’s brand which is associated with quality. The braking system is a bit complicated to adjust at first, especially if you are not a professional biker. If you feel any difficulty is best to go to your closest bicycle shop and ask for help or contact a friend, who might have better knowledge in assembling bikes. On the whole however, it should not be that difficult to get it right and once tested, you will notice soon enough the bicycle performs as expected. The 60mm travel distance of the front suspension fork which absorbs shocks does its job very well and works effective for the price. One tip for extending the life of your bike; spray the frame of the suspension with white lithium grease. This will make them perform much better and you will even extend their lifespan. The gears changes pretty fast and the 21 speed offers wide gear selection. The kickstand also comes in very useful while the twist shifter works well. 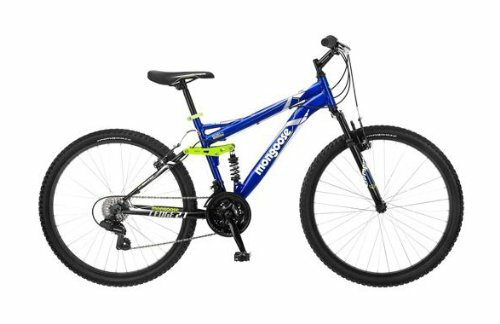 Overall, the Mongoose Ledge 2.1 Men’s Mountain Bike rides well and for the money, offers a good buy.